I've always been interested in installing signals on my HO layout because I like to see them change aspects as the trains pass. Back in the December, 1979 issue of Model Railroader magazine, Gordon Odegard described how he freelanced a signal bridge for his layout. I immediately ordered the brass shapes from Special Shapes and they arrived in a mailing tube in January, 1980. There they sat until September, 2011. In 2011 I was 71 and I hadn't worked in metal since building Suydam kits many years ago. I have never scratchbuilt anything in brass. As you probably know by now, I'm not a master modeller. I'm just an average modeller who is prepared to try to do things. I finally got up the courage to tackle signal bridge construction because I had several places on the Utopia Northern that really needed bridges to support the signals. Either therewasn't space trackside or a bridge would look cool. 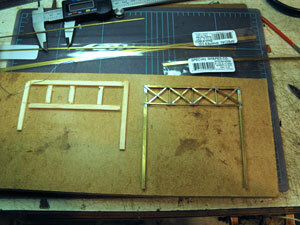 I had a couple of inexpensive plastic signal bridge kits, but I decided a brass bridge would be stronger. Following Gordon's advice, I built a simple jig using balsa wood to hold the principal structural elements in place for soldering. I created a base by gluing a piece of tempered hardboard (masonite) to a piece of plywood. This gave me a good platform on which to solder. I remembered that Suydam kits were assembled using the "sweat solder" technique. This involves tinning both pieces of metal to be joined so that there's a thin patina of solder on both metal parts. I used a file to clean and polish the metal to remove any corrosion, dirt or residue. While rosin core solder is used for electrical work, acid core solder is better for this kind of work. I used an acid paste applied with a toothpick. The work will be thoroughly cleaned before painting. Gordon described this procedure in his article. Flux is required to overcome the resistance between metal parts to be joined. I held the parts together with tweezers while I soldered them. When the parts are pre-tinned the solder melts quickly. The tweezers help to absorb heat away from the joint. It would be possible to use solder that melts at different temperatures to keep joints from becoming unsoldered. You could start with a harder solder, say one with a higher silver content, and then do an adjacent joint with a solder that melts at a lower temperature. Thus far I haven't had to resort to this technique. My work was a little sloppy at the moment as I got the hang of it. At the end of the day I'm more interested in satisfying myself than a panel of contest judges or other modellers. I planned to make this my project at the NMRA NFR tables at Trainfest in Milwaukee that November. I was getting a head start. Note the calipers for measuring. The first step in this signal bridge construction was to make one front and back. The photographs show the setup. Any distortion in the photos is due to the camera and not to the structure. However, it's worth noting that the brass shapes can expand and contract so it is wise not to apply too much heat for too long. Keeping a wet rag handy to cool the work is a neat trick. The solder blobs on sub-assemblies will be cleaned off with a file. The cross hatching on the top is different from Gordon's model. He did this on the side panels. His top panels had single diagonals. After I had both sub-assemblies soldered together I added 1/16" angles to join the front and back pieces together. I didn't use a jig for this. I used three machinist's squares and weights to hold parts together until I could get everything connected. It took some fiddling. I now have the basic structure together and need to add the side braces to complete the sides. 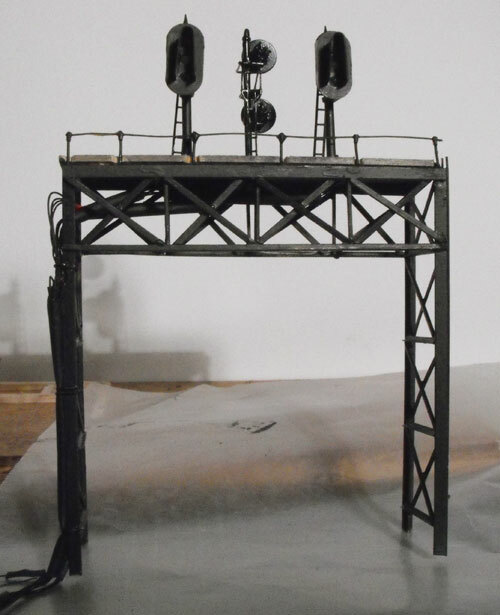 After that will come the railings, ladder, feet, and finally the signal heads and wiring. Side braces are the next order of business. Signal construction takes some effort. It's not a job to be rushed. I had about 40 hours into it spread over a month and a half. Afer getting everything soldered together I went to work on the lights. I used some Oregon Rail Supply kits and reworked them for the signal bridge. These had the hooded shades. I tested each LED as I progressed. There's nothing worse than getting it all together and then finding out a LED won't turn on. I used a two position light for the other side. This has been designed to fit a specific location on my Utopia Northern RR. That's the beauty of making your own signal bridge. It has exactly the lights you want for your track arrangement. There are a lot of wires so I fed them through shrink wrap tubing to keep them organized. I used thin magnet wire for the LEDs. The coating has to be scraped off for soldering the connections. The wires will be fed through the benchwork and connected to other wires for the run back to the circuit boards. I brush-painted the assembled bridge with Polly Scale engine black. The walkway is wood stained black. I found some stanchions at a train show. They're made by Precision Scale. This avoided having to flatten the end of a piece of wire. I found some small diameter wire in my scrap box and used that for the railing. This signal bridge construction was done "by eye" for the most part. 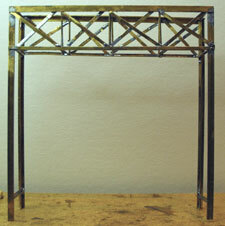 I considered it a practice exercise to learn about making a signal bridge in brass. I didn't follow the article closely, just used it as a guide. It's a little wonky here and there but will serve the purpose. Go from "signal-bridge-construction" to DCC detectors. Go from "signal-bridge-construction" to Making your own signals. Go from "signal-bridge-construction" to Making your own signal circuits. Return from "signal-bridge-construction" to my Home Page.